Their numbers may be dwindling, but there were still 43 Nisei veterans from the 100th Infantry Battalion, MIS and 442nd RCT who traveled all the way to Las Vegas in October for this year’s Friends and Family Nisei Veterans (FFNV) Reunion. They were joined by nearly 200 friends and family members who came to honor and celebrate them in the best way they knew how: by throwing them a huge party. Scott Takahashi, son of 100th Battalion veteran Mas Takahashi, and Scott’s wife Susan were among those who pitched in to make sure everything went smoothly. As Scott put it, “There’s nothing we can do to repay the Issei and Nisei for the groundwork they laid for us. We are blessed with the life we have because of their suffering and accomplishment.” Scott became co-president of the 100th Battalion Veterans Club as a way of honoring the men who put their lives on the line to prove their loyalty to their country. 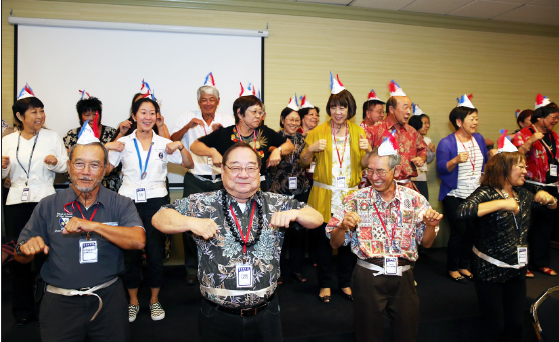 With the passing of many Nisei veterans, this annual event was in danger of becoming extinct when the FFNV and the 100th Battalion Veterans Club joined forces last year to make sure the reunion would go on. The MIS Club of Southern California was also invited to come aboard, and they organized a bus to make the five-hour trip to Vegas easier for roughly 50 people. I spent most of my time in the hospitality suite on the 19th floor hosted by the 100th Battalion people — many who traveled all the way from Hawaii. Arriving after the long bus ride, we were greeted with a spread that outdid the finest Las Vegas buffet. True to the best Nisei potluck, the food was deliciously ample, and organizers made sure no one went hungry. It was a mystery to me how the Hawaii hosts managed to gather Spam musubi, five kinds of poke, and Hawaiian barbecued beef so far away from their homes, but it was all plentifully there. Front row, from left: Edward Sakoda, Steve Sato and David Watanabe lead friends and family in the chicken dance. In Room 1904 one of the best moments of the event took place, according to Scott and Susan Takahashi. Soon after the veterans started arriving on Monday afternoon, several of them chose to forgo the gambling tables to relax in the hospitality room. Before long, onlookers noted a lively conversation with eight 90-something-year-old guys laughing and chatting up a storm. At one point, another family group came in looking to see if anyone knew their deceased vet dad. Sure enough, one of the guys knew him, and the dialogue continued — lasting some three to four hours into the evening. As everyone knows, when you get a bunch of JAs together, there’s always someone who knows someone who is related to someone, and so on and so on. Reunions are especially rife with these connections, and last week’s event was no exception, especially in my case. I had asked my good friend Mary Karatsu to meet my Las Vegas cousin who arrived before me in the hospitality room. We were shocked to discover that my cousin was ex-partners in his medical office with none other than Mary’s youngest brother. Later that night, I was even more surprised to learn that my cousin was also a relative to another friend, Linda, who was related to Paul Nakadate, a leader of the Heart Mountain Fair Play Committee. Because Linda and Mary were also distantly related to one another, this meant my dear friend Mary, who I always felt was like a sister to me, was a relative! Maybe none of that made sense to anyone but me, so as you read it again I’ll go back to what made this reunion memorable. It started early in my stay when 100th Battalion family member Ann Kabasawa tried to convince me to join her and all the “younger” folks (sons, daughters and friends) in the entertainment portion of the dinner banquet. As Ann put it, “We want them to know that even though we didn’t go to war and become buddies fighting together, we are ‘fighting’ together to see that their legacy is never forgotten.” It was a tradition that Ann and the others wanted to be unique each year. This year’s homage involved a lot of preparation, choreography, rehearsal, and even costumes. No, it wasn’t Bon odori, or anything that fancy. It was — yes — the chicken dance! At the sound of the first oom-pah, there were plenty of smiles in the house as grown men and women in chicken hats flapped their arms, swayed their hips and shook their tails to the blaring music. It was a great climax to the fun party. Despite the diminishing number of vets, FFNV leader and four-time Purple Heart recipient Lawson Sakai, who just turned 91, made sure everyone knew that the show would go on next year. Though the exact date has not been set, the FFNV/100th Infantry Reunion will take place in Las Vegas this time next year. For those of you who can’t wait that long to get a taste of how much fun these reunions can be, the 442nd RCT George Company annual reunion has already been set for April 7-9, 2015, at the Fremont Hotel in Las Vegas. Even if you’re not related to a vet, it’s a great way to show how much we appreciate the sacrifice they made for us. If you have any questions about this event, you can contact Ann Kabasawa at [email protected] or call at (808) 781-8540. She says it’s a great opportunity to “talk story.” After all, you never know what distant relatives you might meet there. 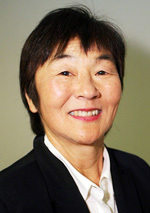 Sharon Yamato writes from Playa del Rey and can be reached at [email protected] Opinions expressed are not necessarily those of The Rafu Shimpo.